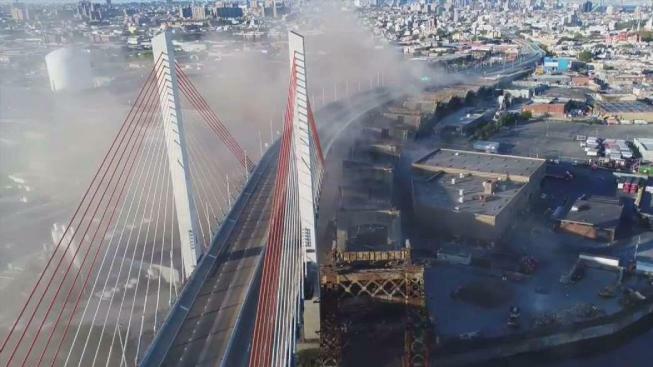 The old Kosciuszko Bridge, which connected Brooklyn and Queens for 78 years, was imploded on Sunday morning as crowds looked on. Ken Buffa reports. The old Kosciuszko Bridge, which connected Brooklyn and Queens for 78 years, was imploded Sunday morning. The long-delayed implosion of portions of the bridge began Sunday at 8 a.m. Gov. Andrew Cuomo led a 10-second countdown then the crowd heard big booms and smoke rise from the old span. The controlled implosion of the bridge will free up space to complete construction of the second span of the new bridge. The old bridge's main span over Newtown Creek was already lowered onto a barge and removed back in July. Twenty trusses that remain, 10 from each side of the bridge, will be recycled as scrap metal — some 22 million pounds of steel in total — following the demolition, according to officials. A plan to implode the Kosciuszko Bridge is causing a firestorm in one part of Brooklyn. Greenpoint residents say the move is bad for the environment and their health. Lori Bordonaro reports. Parts of the bridge were originally supposed to be blown up over the summer, but the demolition never happened. Residents have voiced concern about demolishing the bridge, saying areas near the span are already dealing with poor air quality and pollution. In February, Brooklyn Borough President Eric Adams joined local advocates to voice concerns about the impact of imploding the structure. "Expedition should never trump safety and health quality," he said at the time. 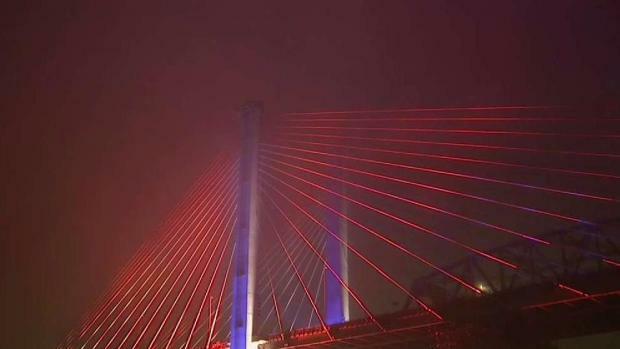 The new Kosciuszko Bridge is bracing for its very first test Friday morning. Tracie Strahan reports. State officials insist the implosion process is safer and quicker than dismantling the bridge piece by piece and that it won't create a large-scale explosion. Gerald Esposito, a member of Brooklyn Community Board 1, had been wondering when the state would dismantle the old bridge, knowing it had been planned for months ago. He says he wasn't happy to find out days before the demolition. "It's pretty outrageous you can't give disclosure to people that you're going to do something," Esposito said. The governor's office said the state DOT did notify community leaders Wednesday about the plan to use small explosives at joints on the bridge, allowing the bridge to fall onto a prepared landing area without polluting the air — a process called "energetic felling." The first span of the new Kosciuszko Bridge opened Thursday night, but the question many people are asking is will it solve the traffic problems? Michael George reports. The first span of the new Kosciuszko Bridge opened in April, with traffic going in both directions on it. When the bridge is completed in 2020, there will be two spans, one going in each direction. Getting the bridge built wasn't easy. It took years of construction and a $873 million price tag. But Gov. Andrew Cuomo promises the new span will ultimately reduce traffic; the old bridge, which the governor says was built for 10,000 vehicles, handled an estimated 185,000 vehicles per day before traffic was diverted to the new span. The new bridge will carry 200,000 vehicles and will also include a 20-feet-wide bikeway/walkway with views of Manhattan, according to officials. The first span of the project to replace the aging Kosciuszko Bridge is opening to drivers this week, and News 4's Andrew Siff got an exclusive look at the 800-pound original plaque that will mark the new bridge's opening along with Gov. Cuomo. But drivers shouldn't expect a major change in traffic congestion there for a few years -- here's why. 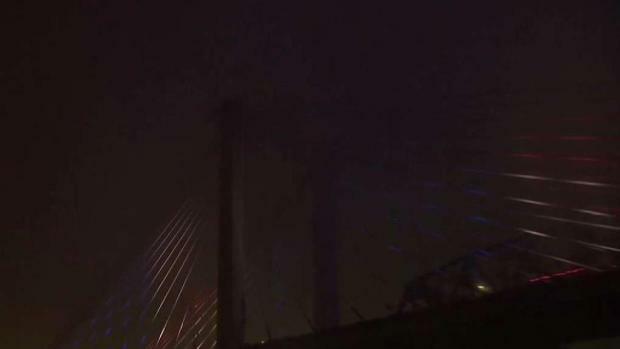 The new Kosciuszko Bridge will be closed from 7:45 a.m. to 8:15 a.m. Sunday for the implosion. A number of roads will also be closed from 4 a.m. to 9:30 a.m. In addition to the street closures below, 56th Road in Queens, between 43rd Street and Laurel Hill Boulevard, and Gardner Avenue in Brooklyn, between Meeker Avenue and Cherry Street, are closed and scheduled to reopen a week after the controlled implosion. Two new bridges will replace the congested and dangerous Kosciuszko Bridge that connects Brooklyn and Queens on the BQE, transportation officials told NBC 4 New York. Andrew Siff reports.